Home Gaming News Clank! In! Space! Apocalypse Arriving this August! Save the Galaxy (or get rich trying!) in Clank! In! Space! Apocalypse! 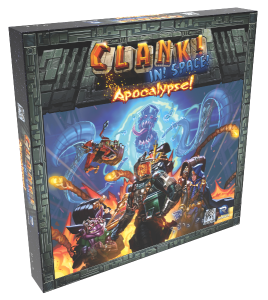 San Diego, CA (May 23rd, 2018) — Renegade Game Studios™ and Dire Wolf Digital are excited to announce the first expansion to last year’s Gen Con break-out hit, Clank! In! Space!. Releasing just one year after the base game, Clank! In! Space! Apocalypse! will be available to play or purchase at Gen Con 2018 or at your local game store in August. Preorder for Gen Con Pick-up! As a member of The Renegade Society, we will make sure you don’t miss future updates about Clank! In! Space! Apocalypse!, including when we post the rule book and fun photos of the game as we get closer to the release!